When it comes to tracing the lineage of humans and other animals, DNA can help us see familial connections spanning hundreds of years into the past. Too bad there wasn’t some distinct wonton DNA marker to help sort some of the murky claims of association for wonton noodle houses. After my visit to McKim’s in Vancouver, I thought it was time for my saga to head south to the United Kingdoms of Chinese Food (also known as Richmond) to seek out other generational wonton makers. In Chinese, Michigan uses the same “Mak” character in its name. Clearly they are implying a connection to the famous Mak’s in Hong Kong. These claims often turn out to be insinuations more than fact. I was definitely curious, but once my Mom and I stepped in I knew I wasn’t going to get any answers. The place was full and running with one fewer waitress than they ought to be. Not the best time to ask a lot of questions. Since my Mom was with me, we ordered a plate of choi sum and typhoon shelter eggplants to go along my wontons and her beef brisket, beef tendon & wonton noodle soup. The leafy veggies were prepared well but not remarkable. As for the other dish, I liked that the eggplant slices were crispy on the outside and soft but not mushy on the inside. The aromatic fried garlic, dried shrimps and chilies paired nicely with the mild aubergine. My wontons arrived with 4 wontons that are similar in size to the ones served at McKims. Michigan also offers a large size if you need one. 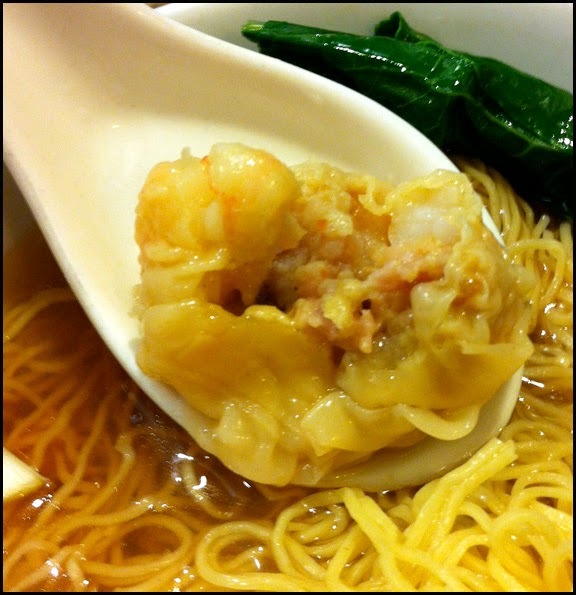 The wonton filling was a bit loose comprised of whole shrimp, which weren’t as firm as I would of liked, and I think a bit of ground pork. I liked the seasoning of the filling and its strong savoury taste. Unfortunately I found the wrapper to be mushy and distracting. The noodles were chewy and nicely prepared. The soup had a bold umami flavour with slight peppery notes but was verging on being too salty. As for the possible use of MSG, I was definitely thirsty soon after my meal but not ill. My guess is that they may use MSG but don’t go too overboard with it. Overall, the execution on the wonton was not as good as my previous visits. I’m not sure if this was an off night or a decline in the overall quality at Michigan. 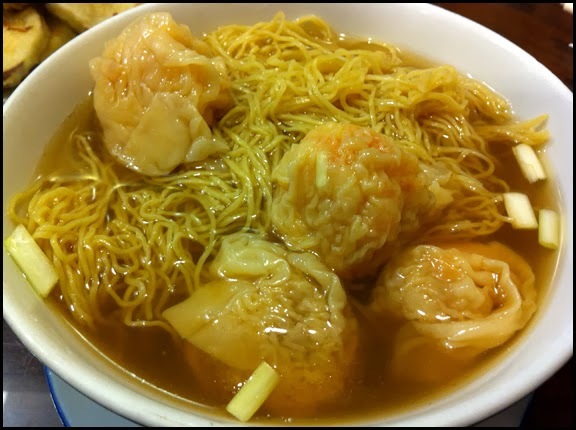 I will definitely have to conduct more visits but I must entertain the idea of downgrading Michigan in my wonton rankings from its lofty #1 position. As side note, I did find this trip fruitful in learning more about what it means to be a legendary wonton maker and my preferences. It seems that if you have made wontons for generations, you only serve 4 modest size wontons with a looser filling. Personally I would like a filling that was more compact. In addition, on my way to Michigan I noticed possibly another Wonton “Saga” on Alexandra Road. I am eager to visit the place I spotted, to see if the patterns I’ve observed holds true for all generation wonton makers.